Low back pain (LBP) has an estimated prevalence of 1.1–66% in children depending on the definition adopted (25, 28). Causes may include infectious, neoplastic, traumatic, inflammatory, musculoskeletal, congenital, and degenerative etiologies. Although lumbar degenerative pathology is less frequent in children and appears increasingly with age (6), various lumbar problems can still cause significant disability in the pediatric population. 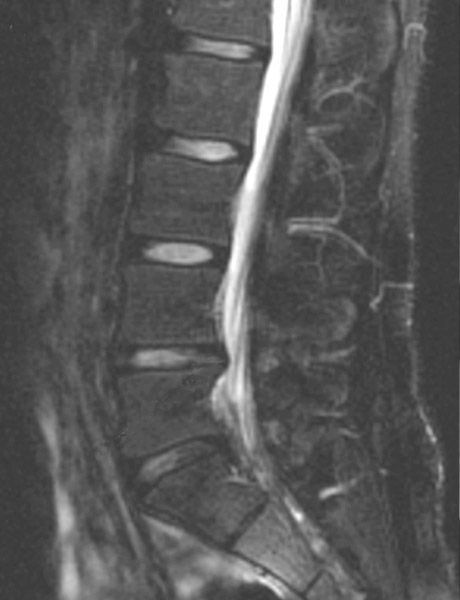 This chapter addresses a more common cause of degenerative lumbar disease among children: disk disease. Although the management of disk disease is often inferred from adult experience and research studies, significant differences exist that must be taken into consideration when managing children. This chapter will highlight these differences. Manage conservatively at start: Initial back pain in children should be managed conservatively, provided no red flags (e.g., neurological deficit, fevers, weight loss, night pain, instability) are present. Image when pain persists: Refractory/persistent back pain in children should be thoroughly evaluated with imaging studies. Traumatic herniations calcify: Traumatic pediatric disk herniations are more often associated with calcified fragments, and an appropriate preoperative evaluation (i.e., radiographs or CT) should be considered. Cauda equina syndrome = surgical emergency: Cauda equina syndrome is a surgical emergency. Patients should undergo decompression and diskectomy immediately.